Benjamins are pleased to bring to the market this truly unique four bedroom detached property. The property is situated in the popular village of Tollerton, which has a number of small local shops, popular primary school, public house and regular transport links to Nottingham City Centre. The Property has a unique OPEN PLAN Living Arrangement, with further scope for additional bedrooms, to the oversized Dormer Bedrooms. Viewing is advised to truly appreciate the space on offer. To the Ground Floor, the property briefly comprises; entrance hall, open plan living and dining room, open plan kitchen with modern fitted units, second sitting room, utility room, two double bedrooms with En-Suites. To the first floor two further double bedrooms and Large family bathroom. Benefiting from Upvc double glazing throughout, gas central heating, large front and rear gardens with Large Garage/Workshop. Having UPVC double glazed front door leading into entrance hall, two radiators, spotlights, thermostat, smoke alarm. Having UPVC double glazed feature bay window to the front of the property, two ceiling lights, double radiator, laminate flooring. Open plan dining room with pendant lighting, laminate flooring, radiator. Having a range of modern wall and base units, granite roll top work surfaces, range double gas cooker with six ring gas hob, granite splash back with extractor fan above, Belfast sink, UPVC double glazed window to the rear of the property, door leading to utility room. Having UPVC double glazed French doors, single radiator, bt line, laminate beech flooring. Having a range of cupboards, space and plumbing for washing machine, Valliant gas central heating boiler, Valliant hot water cylinder, electrical rcd consumer unit, tiles to floor, UPVC double glazed door leading to side garden. Having feature UPCV double glazed bay window, single light fitting, radiator, carpet to floor, door leading to En-Suite bathroom. Having UPCV double glazed window to the side of the property, corner shower cubicle with shower fitting, vanity wash hand basin unit, toilet, part tiled walls, extractor fan, stainless steel radiator, light fitting, tiled flooring. Having feature UPVC double glazed bay window, single light fitting, radiator, carpet to floor, door leading to En-Suite. Having UPVC double glazed window to the side of the property, corner shower cubicle with shower fitting, vanity wash hand basin unit, toilet, part tiled walls, extractor fan, stainless steel radiator, light fitting, tiled flooring. Having wash hand basin, toilet part tiling to walls, radiator, tiled flooring, extractor fan. Stairs leading from the ground floor with wooden banister, large velux window to the front of the property, radiator, laminate flooring, radiator, pendant light fitting, access to eves storage space, access to two bedrooms and family bathroom. Having UPVC double glazed windows to the front and rear of the property, two radiators, light fitting, carpet to floor. Having UPVC double glazed window to the front and rear of the property, two radiators, light fitting, carpet to floor. 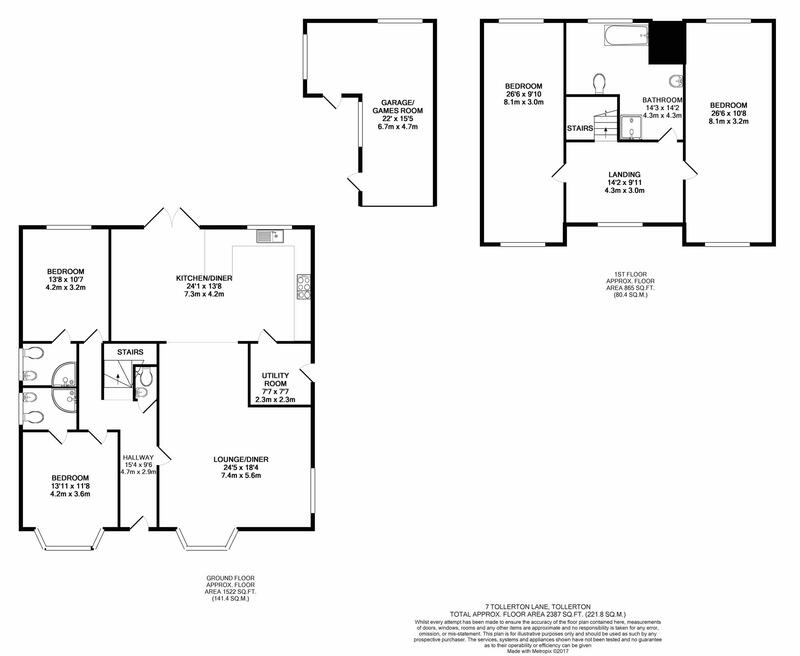 Three piece white bathroom suite comprising; bath, fitted vanity wash hand basin, toilet, radiators, Upvc double glazed window, stainless steel radiator, extractor fan, part tiled walls, tiles to floor. Having Up and Over door, Electrics & Lighting. A very good size enclosed private garden with block paved patio area, large laid lawn. 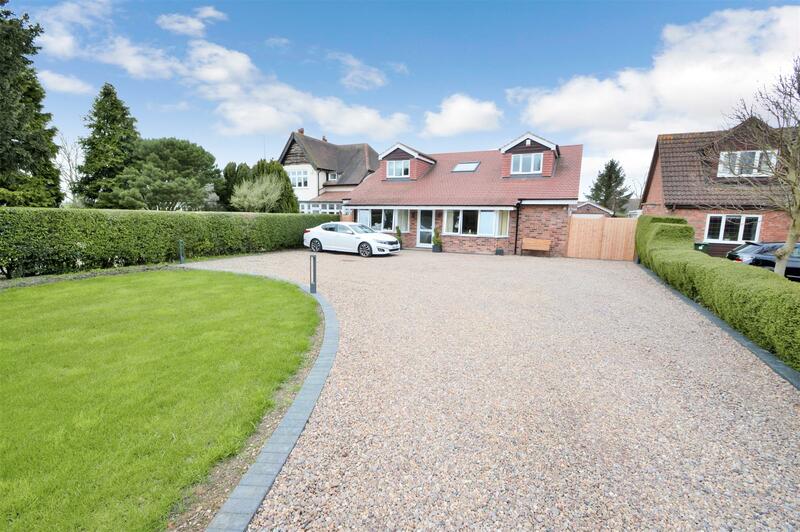 A large gravelled driveway providing space for a number of cars, laid lawn with curb edgings, wooden gate leading to garage and rear garden.